Simian Crease the Single Horinzontal Palm Line. On a small proportion of hands, the heart line (distal transverse crease), and head line (proximal transverse crease) appear to be joined into a single line. One long line across the palm is the Simian crease or line. The association of this line was once thought only to be with chromosomal disorders such as Down syndrome. It is possible that somewhere down the family line, someone was affected by the down syndrome. However, it is mostly considered a regular feature. It is more common in Asian countries. See a video lesson about the Simian line here. Because the emotion line and the practical thinking line are together as one, the person might be intense in their feeling or thought. The owner of a Simian crease can possess great potential for strong will and focus, many of whom are ambitious and driven, primarily if they have found their niche and had opportunities in their life regarding education and family support. With a Simian line on both hands, they can show the opposite; that is to struggle with their ambition. (Unless early life was directed well). This intense feeling or thought is on the inside and outside. The bursts of energy may come in stages of ‘full on’ or ‘full off’. So they might discover their passion and go for it, ‘all in’. If anything happens where they are confronted with an obstacle, it might be an instant ‘all out’. However, to hypothesize about this crease, compare other features of the hand, such as hand shape, finger length, thumbs, and lines; including fingerprint and palm patterns. 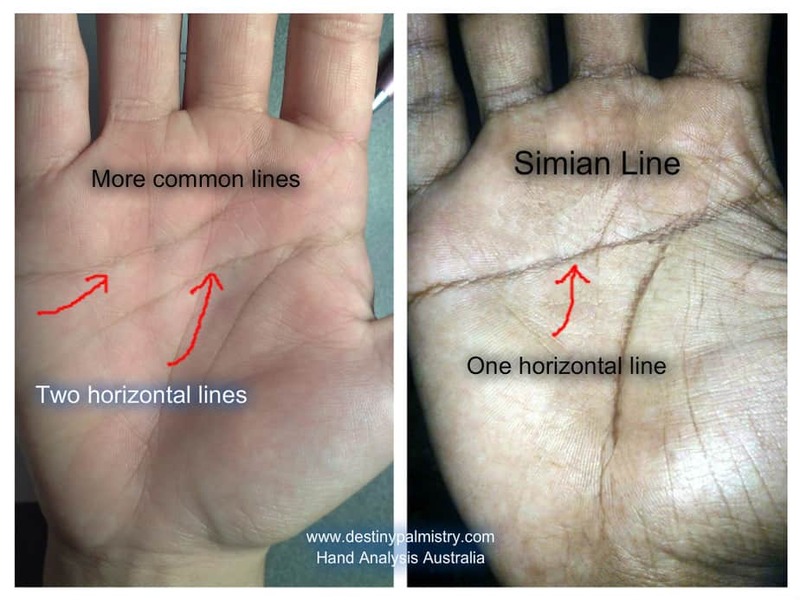 There are many variations of the Simian line such as the Suwon crease, where there is a heart line all the way across the palm or second section of a head line fused to the heart line. The Sydney line which is a head line that crosses the palm, but a heart line is still present. These variations are a little more complicated in their meaning. There may be pressure on the emotions or mental capacity, and so the individual tends to over analyze feelings or thoughts. The positive side to it is that they can absorb much of the information, thus making top researchers. Do Simian Line Survey Here – Get Free Hand Reading Tips Ebook. Please donate any amount to help us continue this quality content. Thank You! Previous PostPrevious Long Narrow Hand What Does it Mean in Palmistry?